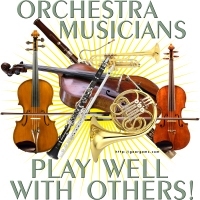 The caption on this ensemble of musical instruments is “Orchestra Musicians Play Well with Others” If you play in an orchestra or have someone on your gift list who does, they’ll love to display this great design with violin, viola, cello, flute, clarinet, French horn, and bassoon! We also have a Chamber Musicians version of the same design! Get a t-shirt or any other gift item for the orchestra member in your life.